Photo by Joye Braun, on the front line. KILI Radio photo. Now from the front line. The water protectors were given an hour notice to disperse. That hour is now over. It is being reported that the protectors are being slowly surrounded by highly militarized law enforcement. Our elders and spiritual leaders have put up alters the protect the water and our People. The prayers are strong and our warriors' hearts will not back down. We are asking for prayers and support! The time is now! Please come to the frontlines! Rev. 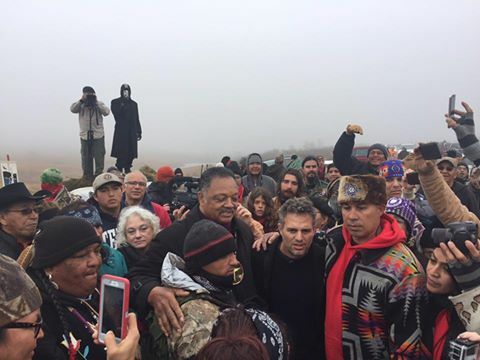 Jesse Jackson and actor Mark Ruffalo are on the front line. directly on the path of the pipeline construction. convoy of police that is staging nearby. "No matter what, we are going to protect our water." He said the main kitchen has shut down, and everyone is on their own for food now. Some kitchens are feeding others. "We need the hunters to bring us food. There are no guns here." 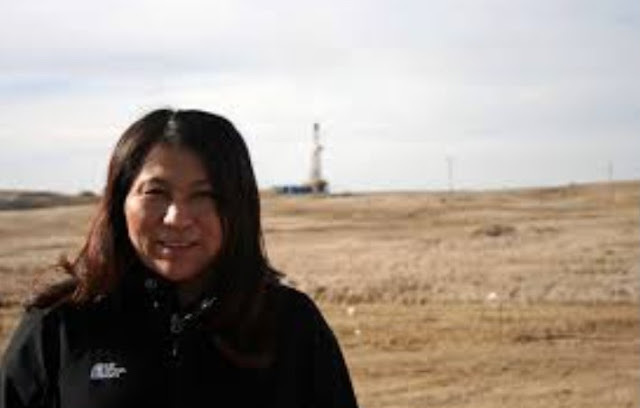 "We are brave people, we are Lakota people." there are not enough cells. "Why are they doing this to us?" all day in the cold by the police. "It is not an armed struggle, it is a peaceful struggle." "What kind of government goes against its own people?" "It's about money. It's about who makes the most money, the fastest." He said it is hard to stay, and not go home to warm beds. "Use this new technology to get the word out." high alert at night, and water. to remove a peaceful people. "We have many different colors of people standing together." "We need the tribal governments to stand up and help us." Many of the warriors were up all night last night, on high alert. UNICORN RIOT -- The situation here is escalating quickly. Police and military are staging a few miles down the road from where the water protectors have set up barricades. People here are preparing themselves both physically and mentally as they expect a raid by authorities at any moment. There is now a no-fly zone over the area. Police are targeting journalists and taking our equipment and footage. Multiple militarized police checkpoints surround the frontline camps and are screening vehicles driving in and out of the area. Helicopters and planes circle the camps continuously gathering geospatial intelligence. The various camps are digging in and preparing for colder weather as warriors defend the barricades from an impending attack at any moment. Unicorn Riot intends to document whatever happens next on the frontline when the police and military return. Censored News has no ads or revenues. No content may be used without permission. No content may be used for profit making purposes. This includes advertising, click bait, Adwords and all profit revenue schemes. Copyright notice: Each writer, photographer and videographer maintains their own copyrights. This is an amazing powerful video that must be shared! Take the time to watch and listen! Thank you, Water Warriors, for standing up for our people against the mercenaries, government agents and DAPL! As a Nation, we will not surrender! Too much has been taken from us for centuries. The time has come to make a stand!NODAPL!! NODAPL!!! NODAPL!!! i am with you. i am always with you. i will never leave you. An all white reindeer was seen in Sweden. And white deer in WI. Read that Ladd Ericsson, McLean County Prosecuter isn't fit for office. He files charges against journalists to intimidate and silence them. The state of North Dakota is willing to stick its neck out and bend over backwards & jump up & down for the pipeline company spending taxpayers $$ foolishly. The water protectors are peaceful so all the police had to do was arrest people who were willing to be arrested for their beliefs. How simple is that ? 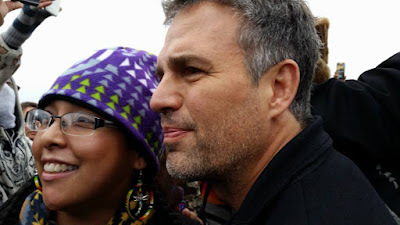 North Dakota doesn't need tanks to arrest citizens who have decided to be arrested ! How ridiculous are the police, prosecutors, & judges in North Dakota? Is North Dakota some backwoods, racist, Indian hating, piece of corporate real estate that didn't get the memo that the USA has a constitution ? or do they think they can just take a crap on anybody or everybody that they want to ? The citizens of ND are being tricked. Another example of ND throwing $$ away (Millions$$) on the rich when ND should spend on what citizens need, home weatherization, prescription medicine coverage, doctor bills, food, housing, daycare, education. If Energy Transfer pipeline Company wants all those millions $$$ in tanks, planes, helicopters, military, to push their project through INSTEAD of going to court, then Energy Transfer should pay for it.